If you’ve ever wondered what a live-action TOY STORY would look like if all of the toys were replaced by sun-damaged G.I. Joes, look no further than PREDATOR. Known internationally as MUSCLES: THE MOVIE, PREDATOR is about a group of sweaty men and their quest to defeat a giant alien lizard monkey, before it defeats them. And who better to make fun of this movie than a couple of guys who know a thing or two about being sweaty and terrified – Mac and David! 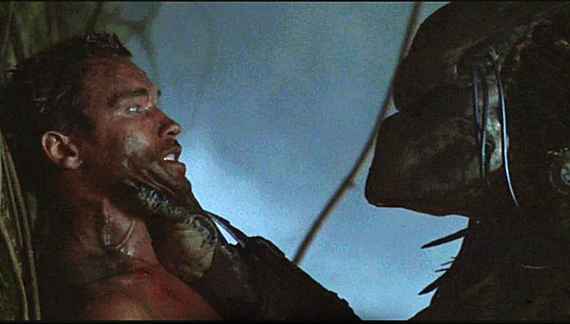 Mac and David are back together with Master Pancake Theater to take on PREDATOR, one of the most bullet-heavy movies of the 80s. Starring former governor Arnold Schwarzenegger, former governor Jesse “The Body” Ventura, and a whole host of future former governors, this movie is sure to answer the question: Holloywood’s cocaine problem in the 80s resulted in a lot of terrible decisions, right? Programming note: Mac will not be at the 9/26 and 9/27 shows, because he will be in Denver.